Hello friends! Coming back at you after an awesome and yet almost two short three day weekend! As you can sort of see behind me - the window is new! I'll give you a before and after shot at the end of the post. The installation went very well, they now need to put back up the siding on the outside and the wallboard on the inside, but we have time to deal with that! While the boys worked on that, my mom and I went to Clothes Mentor since they were having a 25% off kick off to fall sale. 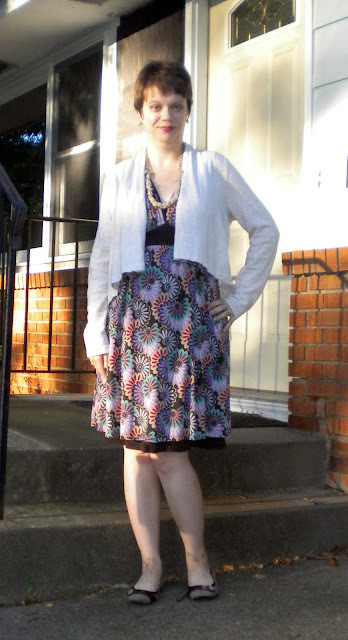 My mom was awesome and helped me buy a couple of things to start moving my maternity wardrobe towards fall and winter! After the guys finished on Saturday I let Mr. Monkey totally crash and do nothing, we got take out for dinner and had a movie night. Sunday we slept in, went to the Farmer's Market for a couple of things, came home and made some breakfast. Then we took on the daunting task of starting our baby registry - but it wasn't as bad as we thought it could be. And since we weren't completely burned out yet, we also stopped at a Lowe's to look at window treatments for the new window. We headed home to make dinner and have another movie night. Yesterday the Pants Monkey decided to smoke some meat for a barbeque with his parents and while he did that, I hit the thrifts for 50% off day. For under $30 I scored five tops and a pair of pants and a dress. All of which is versatile enough I think I should be able to wear it all after the baby is born too. So I was pretty happy about that! And now today, back to the grind. 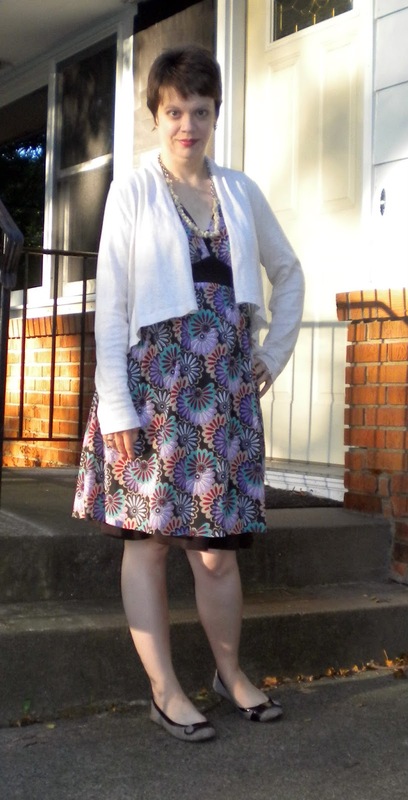 Decided to give this Japanese Weekend dress another spin, especially after I learned that not only did I get a great deal on it, but it's also a wonderful US made company. It's always good to know that kind of information! I still need that haircut, but tonight Mr. Monkey has his fantasy football draft with his work, so I am finally getting that done while he's gone, yay! 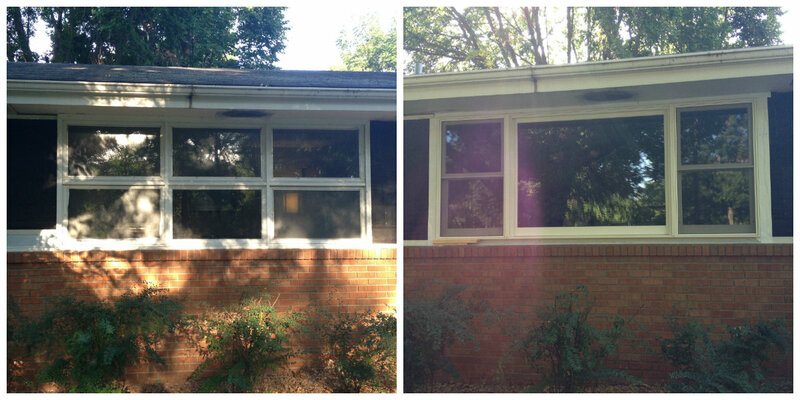 And I'll leave you with the window before and after - we're pretty excited about how it turned out! It sounds like you had an awesome weekend! The window looks great. That is a huge job installing a picture window like that. My husband and I did our picture window and it was heavy!!! Super cute dress and can't wait to see you style all your new loot from the thrift store. I love that dress on you! Awesome to hear about your great finds at the thrift store! I can't believe the difference the new window makes! It looks wonderful!! 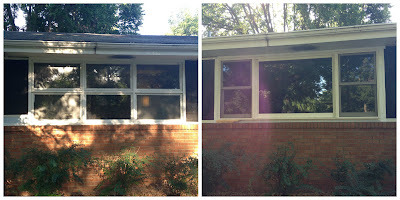 The windows are looking good, Beth! And I really LOVE this dress and bonus that it's US made! The windows look great - nice and open. Love your pretty dress. Isn't it nice when you can find something ethically made? Yay for the new window! That is awesome that the cute printed dress is made in the US. Can't wait to see your new clothes you got this window! I love the outfit and the windows! You look so awesome! I am bummed I missed the shopping, but I was too pooped to leave the house. I can't wait to see your new stuff! i always forget about the clothes mentor...i need to get out there more!! how awesome that you have so many new maternity clothes now!! You had a great weekend Beth:) Lovely dress and the new window is looking good!! The new window looks great! Glad to hear that you found some great deals this weekend to get you set up for the fall...it took every ounce of my willpower to not hit up the sales this weekend! That dress is still amazing, and that window -- nice work to the Pants Monkey! I lurv the dress. It should work for you for some time!! And the window looks great! Way cute and super windows. Congrats.